Fourth-year student Nathan Whelham celebrates with his family during Match Day on Friday, March 15, 2019, as he learns where he will be headed for residency training. With the opening of each envelope, the lives of students in the medical school’s Class of 2019 were changed Friday and their next steps as young physicians – in a matter of seconds – came into focus. 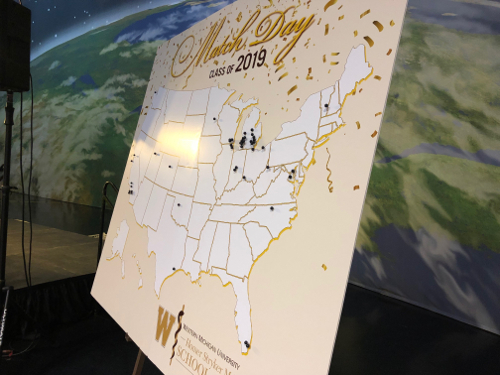 That was the scene when the clock struck noon at the Air Zoo in Portage where the more than 50 students who make up the second MD class of WMed participated in the time-honored event known as Match Day. “We’ve done very well as a school and this class did very well, and our students are going to some very good programs across the country,” said Hal B. Jenson, MD, MBA, the medical school’s Founding Dean. With Match Day, the Class of 2019 joined students from other medical schools across the country on Friday, March 15, to learn where they will spend the next three or more years in residency training. The festivities were a culmination for WMed’s fourth-year students as they each learned their future plans. The anticipation and excitement – along with a bit of apprehension – began building Friday morning when students, along with their families and friends, invited faculty and members of the leadership team at WMed, gathered at the Air Zoo. As the students waited to open their envelopes, they greeted one another with smiles and nervous chatter filled the venue. Cell phones were at the ready as students and their families and friends snapped photos and selfies to capture the moment and document the joy of the big day. At noon, the wait was over. The students opened their envelopes, each discovering where they would be headed for residency. Every student in the Class of 2019 matched to a residency slot as part of a nationwide process that is increasingly competitive. Four students from the Class of 2019 matched to residency slots at WMed and will complete their training in Kalamazoo in the specialties of Internal Medicine, General Surgery, and Emergency Medicine. They will join the 200-plus physicians-in-training in the medical school’s 13 residency and fellowship programs. 17 students will remain in Michigan for residency, working in hospitals in Detroit, Flint, Grand Rapids, Jackson, Kalamazoo, Livonia, Rochester, Royal Oak, and Saginaw. 22 students will complete their training in a specialty that could lead to a career in primary care. Two students are recipients of scholarships from the F. Edward Hébert Armed Forces Health Professions Scholarship Program (HPSP) and will complete their residency training at military medical centers. WMed students will train in residency programs in 20 different states and the District of Columbia, across the US. 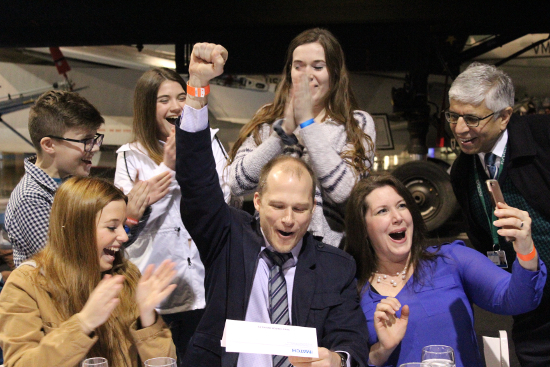 Match Day festivities for the Class of 2019 were held on Friday, March 15, 2019, at the Air Zoo in Portage. The 2019 Main Residency Match process began in the fall for fourth-year students at WMed and other medical students across the country when they applied to residency programs at which they wanted to train. As part of the process, program directors review applications and conduct candidate interviews in the fall and early winter. From mid-January to late February, applicants submit to the National Residency Matching Program (NRMP) their rank order lists of preferred programs, and program directors rank applicants in order of preference for training. The NRMP uses a computerized mathematical algorithm to match applicants with programs using the preferences expressed on their rank lists. As they look ahead, students in the Class of 2019 will complete the final months of the fourth-year curriculum at WMed, which culminates in May with a commencement ceremony at the Wings Event Center in Kalamazoo. The event, which is scheduled for 10:00 a.m. on Saturday, May 11, 2019, is open to the public.